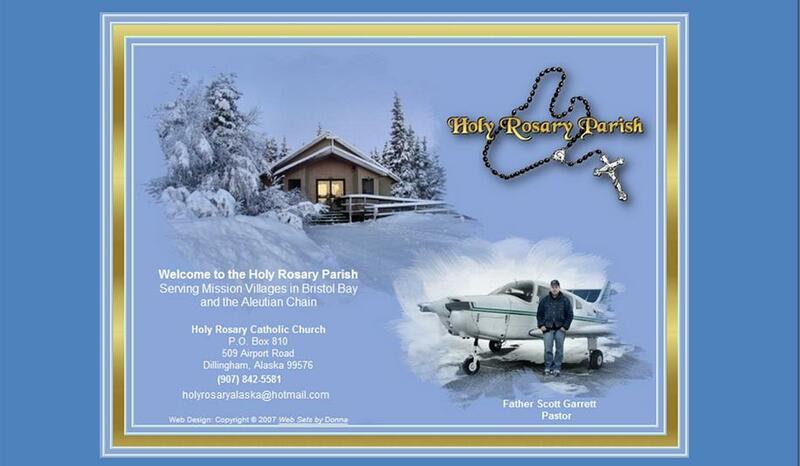 Friday, February 26, 2010 I flew to Clarks Point, Alaska (airport identifier PFCL). I fly to Clarks Point every Friday. Clarks is a short 12 mile hopp, skip, and jump Southeast from Dillingham. It was such a beautiful day I decided to fly East until I hit Bristol Bay then Northwest up the coastline to Clarks Point. It was an additional 25 miles or so. Doug, the principal of Clarks Point School, picked me up and drove me to the school where Betty Gardiner (secretary) and Judy George (cook) work during the week. After arriving at the school I jumped on Betty’s four-wheeler and she drove me to Louise Gardiner’s home. Louise is Betty’s mother and the elder of the village. I gave Louise communion and then posed for a picture with her. Betty and her mom Louise pose for a picture after communion. Next we stopped by Betty's home and I said a prayer with Betty's daughters Brittany and Justine and Brittany's new baby Jack (who I will baptize next month or so), her other son Samuel, and Justine's son Trevallian. We then four-wheeled it back to the Clarks Point School for lunch. Since it was Friday, and it was Lent, Judy cooked Alaskan Salmon for Lunch, which was donated by Peter Pan fisheries. Below, Judy George prepares the lunches for us. 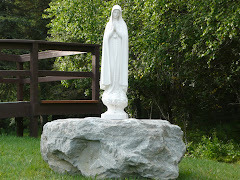 JB and Tiffany both attend Mass in Clarks Point and are students in the school. I new type of math has them making snowflakes and paper patterns for parkas. It is quite a creative way to learn math. Here is JB's paper parka pattern. Here is Tiffany's parka pattern. All of the children's parka patterns are hung up on the gym wall. Here is a snowflake made by Tiffany using the methods from the new Math Program. I heard through the grape vine that Betty needed to get to Dillingham. Betty is afraid to fly with just anyone. Most villagers, after finding a safe pilot, will stick to them through thick and thin. For example people from Manokotak fly with John Bouker (Bristol Bay Air) and Yupik villagers from Clarks Point fly with Mat Vandeventer (VanAir). Mat Vandeventer, owner of VanAir. John Bouker, owner of Bristol Bay Air. To make a long story short, Betty actually agreed to fly with me back to Dillingham. It took me over two years of flying out here before I finally felt comfortable taking up passengers. After flying out here four years people in the villages are actually starting to take note of my experience. With only about 550 total hours I still do not consider myself a bush pilot…maybe after a thousand or so. Upon landing in Dillingham I was lucky and my approach was nice and slow and I landed smoothly, i.e. without bouncing and without a controlled crash landing. I think Betty was actually impressed. Fly Safe out there and hope you are having a prayerful Lent. 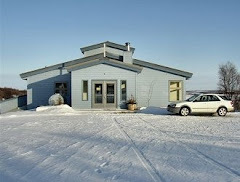 Yesterday, Tuesday, February 23, 2010, I flew to Igiugig, It was a fairly good day for flying. Bristol Bay was in the middle of two systems, a low pressure moving out and a high pressure moving in. Although a little windy, the visibility was stellar. Anything over five miles visibility in Bristol Bay is considered a great day. Igiugig (airport identifier is PAIG) is one of those tough words to pronounce. It is something like “igeeawgig.” When I first came to Bristol Bay in August of 2005, I would always mix up Egegik and Igiugig because they sounded similar. Igiugig is 82 miles Northeast of Dillingham. To get there directly I flew over Portage Creek, located on the Nushagak River and Levelock, located on the Kyichak River. Igiugig is located right on the South end of Lake Illiamna at the mouth of the Kyichak River. The Kyichak flows into Bristol Bay. I practiced the GPS approach for runway 05, as opposed to the approach to runway 23 which takes you out across Lake Illiamna. From the South I flew to the Southeast of Igiugig to a waypoint named FABMU, then turned back to the west and followed the GPS to a waypoint called HABIB. At HABIB I turned to 050 and lined directly up with the runway. Here is a picture just before I turned at HABIB. 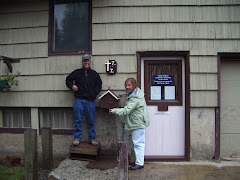 The late Father Jim Kelly, who died in a plane crash near Manokotak in 2002, always told the story about flying to Igiugig one time to have mass for Dan Salmon (mayor of Igiugig) and his family. He had called Dan the day before from Dillingham to alert him of his arrival. A few miles out of Igiugig Father Kelly saw Dan taking off in his airplane. Father Kelly got on the radio and ordered him back to the village for Mass. Dan reluctantly turned around and landed. Father Kelly landed a few minutes later. 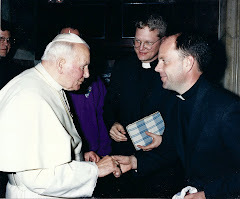 Many of Father Kelly’s friends still tell me the story. A couple years ago (2008) Dan Salmon also died in an airplane crash near Big River Lakes. Big River Lakes is near the entrance to Lake Clark Pass. 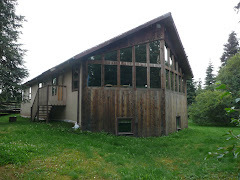 Dan was flying from Anchorage with supplies to his home in Igiugig. People from all over the area came to his funeral. It was a tragic accident and nobody really knows why his plane went down. Here is a picture after I departed runway 05, looking back at runway 23. Here is a picture from the Northwest. It shows the Kyichak River and the beautiful little village. Heading back to Dillingham I took a picture from the Southwest of Igiugig. From the south, the Kyichak Rivers leads up to Igiugig. 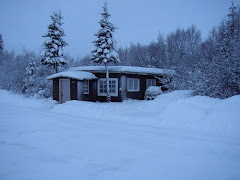 February 11, 2010, I flew to Levelock, Alaska. The airport identifier for Levelock is 9Z8. This small village is nestled right next to the Kvichak (Kweejack) River. The river runs between Bristol Bay and Lake Illiamna. Levelock is located about 10 miles north of where the Kvichak River feeds into Bristol Bay. The population of Levelock is about 50 year around residents. Please CLICK HERE for more information about Levelock. Levelock is located 42 miles to the east of Dillingham. The route is basically at sea level across tundra, lakes, and rivers. The highest spot is about 500 feet, which is a few miles northwest of Levelock near New Stuyahok. Last year in a snow storm, one new pilot flew into what we call the "milk bottle" and crashed into the ground at five hundred feet near this area. The "milk bottle" is when the ground is white, the sky is white, and well, everything looks white. He survived...by the grace of God. It is tricky flying out here. One of the lessons a bush pilot learns about gravel runways is how well they hold up when the snow and ice starts to melt. Some runways get muddier than others, for example, the Portage Creek runway gets muddy in the spring. Some runways stay firm even in the spring. Levelock is a runway that seems to be built on good soil. I have never landed on it when it was soft, even during spring thaw, but don’t take the chance. Always try to get a runway condition report. Approaching Levelock from the west is Runway 01/19. The below picture was taken while turning final to runway 01 in Levelock, Alaska. Here is a picture of the Warrior II parked at the Levelock Airport. This picture was actually taken a couple months ago. 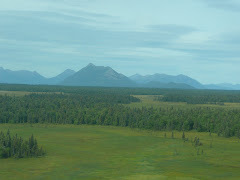 After departing runway 01 in Levelock, here is a picture looking back to the east toward King Salmon, Alaska. King Salmon is about 20 miles southeast from Levelock. If you were on a right base landing on runway 19 in Levelock, this is what you would see. 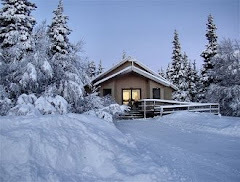 Here is a picture of Levelock, Alaska, which is about two miles from the airport. Naknek, Alaska is a small fishing village in Bristol Bay. 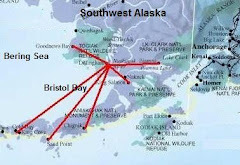 It is about 52 air miles east, and a little south, of Dillingham. 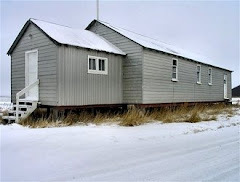 The location and name are sometimes confused because Naknek shares the only paved road in the entire area with another small village, King Salmon, Alaska. To put things into perspective, both Naknek and King Salmon have about 500 year around residents each. The 12 mile long paved road, which runs from East to West along the Naknek River, separates the two remote villages. Pavement is rare in the Alaskan bush. King Salmon is located on the East end of the pavement while Naknek in located on the West end. The two fishing communities are unique because they share resources. 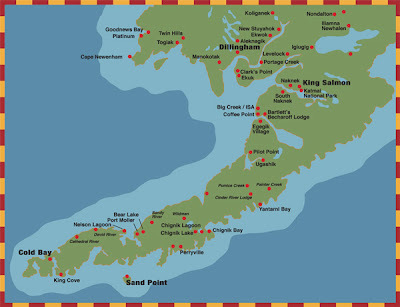 For example, the High School is located in Naknek so the students from King Salmon travel to Naknek to attend school. On the other hand, King Salmon has the major airport with two paved runways, ILS, and control tower (due to the Military installation that is now only a skeleton crew), while Naknek has two small dirt strips that look like a giant L from the air. Here is a light/picture/model on the side of one of the hangers on the Naknek Airport. How cool is that. Normally when flying to Saint Theresa for mass every week from Dillingham, I fly into the larger airport, King Salmon. I have a place on the East Ramp to park and plug in the Cherokee Warrior II (Tibbits Airmotive). Naknek has a smaller airport. Below are a few pictures of the airport area. Click on all pictures to make them larger. If you click on the picture below, you can see the L shape of the two runways at the Naknek Airport. The larger wider gravel runway runs North and South (runway 32 and 14). The one lined with aircraft runs East and West (runway 26 and 08). Here is nice picture of runway 08 and 26, which shows the aircraft lined up along the small gravel strip. King Air is the main air taxi out of Naknek. Jay, at King Air, has a number of aircraft. One is a Cherokee that is simalar to our Warrior II. King Air is located right where the two runways come together at the L. Jay might need to spruce up his sign a bit. Here is where King Air, and probably everyone else in the area, fuel up before flying off into the Alaskan Bush. Both communities share the Catholic Church, Saint Theresa. 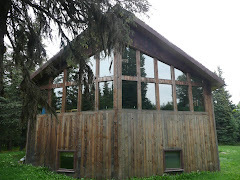 The beautiful church is built half way between the King Salmon and Naknek. During the fishing season fisherman are packed into Saint Theresa. Last year, beside our regular year around parishioners, we had an additional 40 or so fishermen attend on a regular basis. For some reason that I have not been able to figure out, old cars are lined up end to end along the road to Naknek petitioning off a certain area. Colorful. Original. It says it all. Nice Sign! I am not positive, but I think 3-wheelers were out-lawed 20 years ago? Here is one of the several accommodations if you plan on spending the night in this cozy fishing village. The Naknek Trading Company is a grocery store and is a popular place for all visitors. This building has groceries only. Next door the General Store (shown below) offers hardware and clothing. The General Store sells about everything except groceries, i.e Carharts, watches, frying pans, etc. Need to rent a truck? No problem in Naknek, Alaska. When two or more businesses are located in the same area what do you do? Here is what they do in Naknek. Processing salmon and storing boats for the winter is big business in this small fishing village. Several processing plants and boat storage facilities exist. These fish processing plants are located right on the main drag in Naknek. Here is another fish processor. When I first heard the name I had to get clarification. Am I hearing you right? YARD ARM NOT! This Glacier Construction, in my opinion, gets the prize for artistic talent. 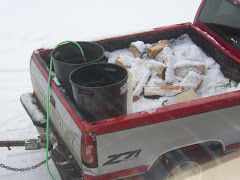 Here is something one does not see much of in the lower 48 states. This is unique to Naknek! My favorite sign. A kind of sockeye salmon windmill. Very creative! I think this is the local Starbucks, well, maybe not Strarbucks, but a great place to have a cup of joe. THE SHICE. Safe travels to all. 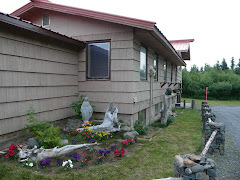 If you are ever in Naknek, be sure to stop in at Saint Theresa Parish. Mass is every Sunday at 9:00 AM.